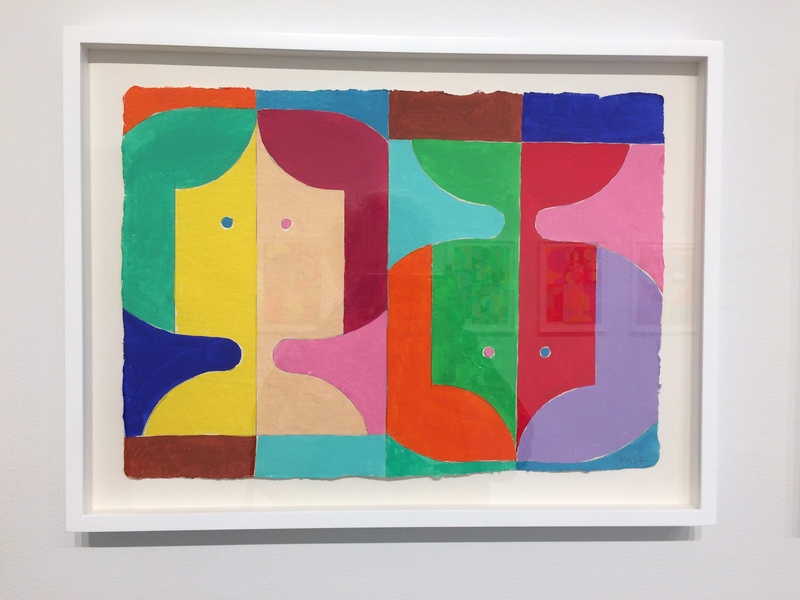 The paintings on display at Eric Erickson’s solo exhibition at the Buster Levi Gallery in Cold Spring, NY are part of a new series referred to as “Diagrams”. 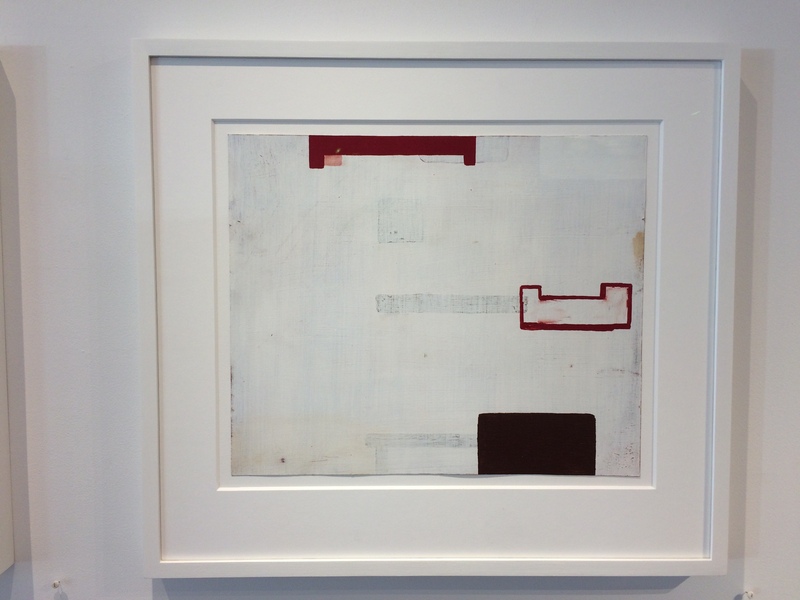 According to Erickson this work is “related to dubious diagrams often found with anything needing home assembly”. The artist has taken the inaccurate 2-D schematic representations for the 3-D items we build and live with everyday and distilled the geometric qualities of these images into solid blocks of color and subtle painted line drawings. 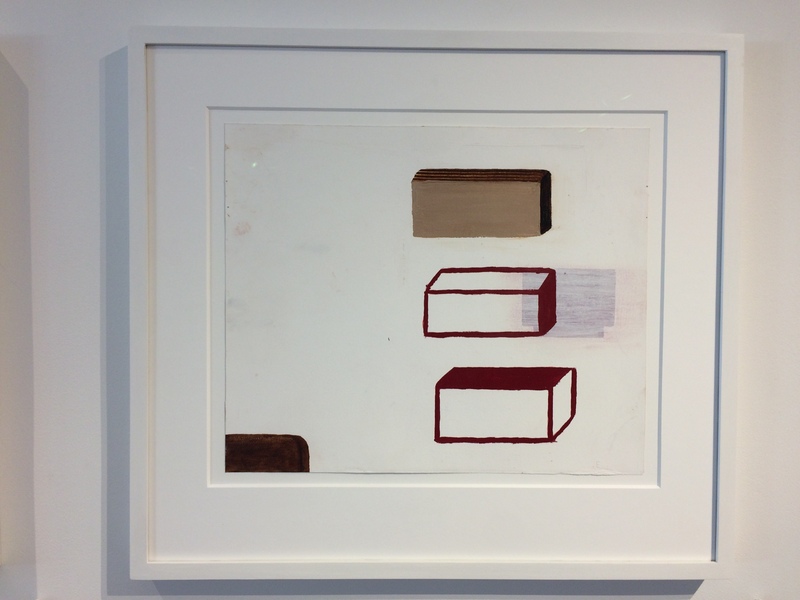 Although the original instructional diagrams may have lacked the necessary information to accurately represent real objects, the shapes themselves create interesting compositions. The James Cohen Gallery is currently presenting “A Line Can Go Anywhere”. 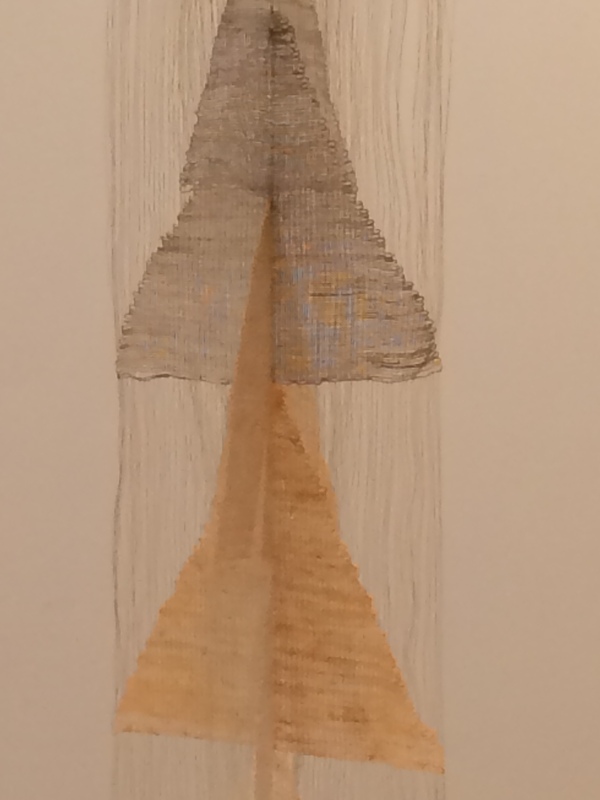 Curated by Jenelle Porter, this exhibit features the work of 7 fiber artist from the Bay area. I was particularly intrigued by the work of Trude Guermonprez. 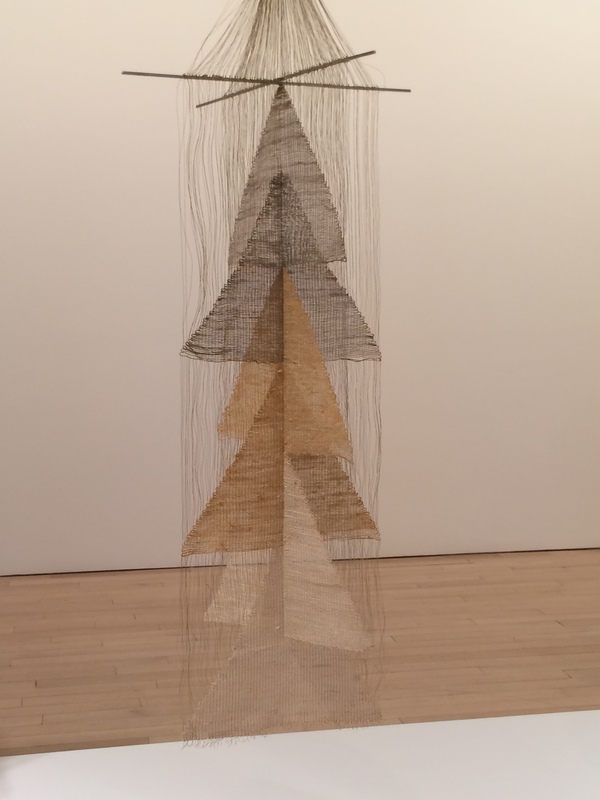 This untitled work from the 1960’s has two perpendicular planes of weaving. There is usually a grid-like nature to a weaving produced by the warp and the weft that gives it mathematical properties. Creating isosceles triangles, Guermonprez has broken the squares we expect in a woven grid with exciting results. The exhibition “Polly Apfelbaum: The Potential of Women” at the Alexander Gray Associates gallery features a new series of gauche paintings inspired by the 1963 book “The Potential of Woman”. Written for a symposium of the same name, this text offers a condescending outlook on the future contributions of women. 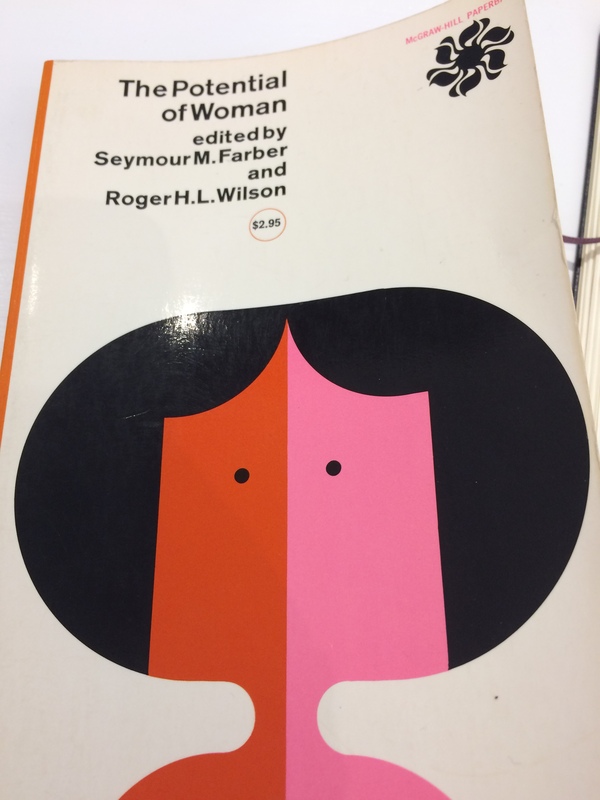 The cover design by Rudolph deHarek features a portrait of a woman’s head using flat shapes of color with a vertical line of reflective symmetry. 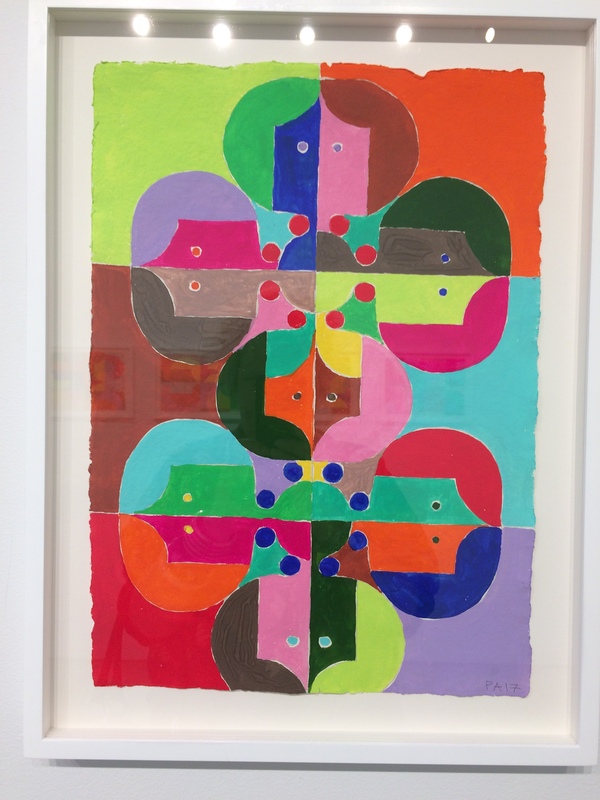 Using this image as a staring point, Apfelbaum repeats and rotates the original form to create paintings with a variety symmetrical properties. In this work the woman’s head has been repeated once and rotated 180 degrees, creating order 2 rotational symmetry. For this next painting the head is repeated 6 more times. The arrangement of 7 women offers some more complex patterns. By slightly altering the central figure the artist was able to impose both vertical and horizontal lines of reflective symmetry in this work. Apfelbaum’s appropriation of this particular image offers a socially charged commentary. The use of mathematics to manipulate the image creates a dynamic visual dialogue. 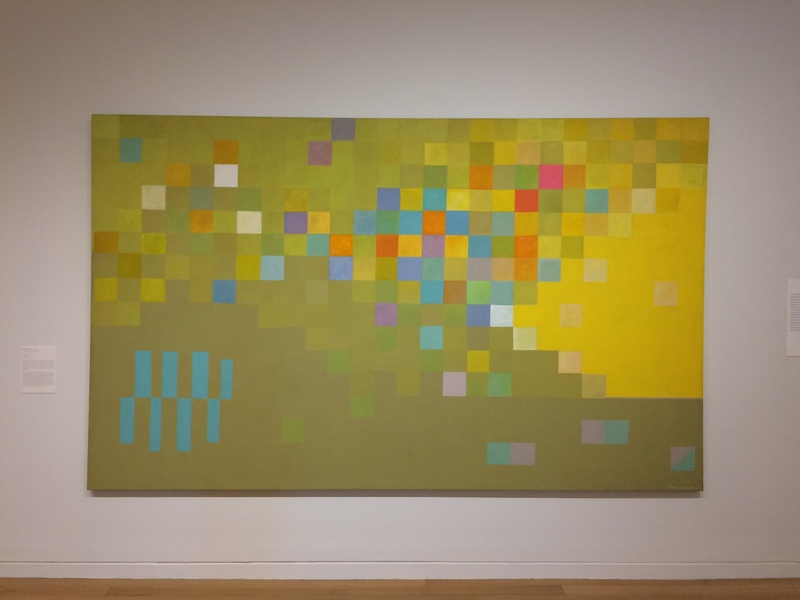 “Expanding Abstraction: New England Women Painters, 1950 To Now” at the De Cordova Museum. One of the more interesting Summer exhibitions that I visited this year (open till mid September) is this show at the De Cordova Museum in Lincoln, Massachusetts. Many of the paintings on display feature mathematical themes. Geometry was a popular subject for abstract artists in the 1970’s. 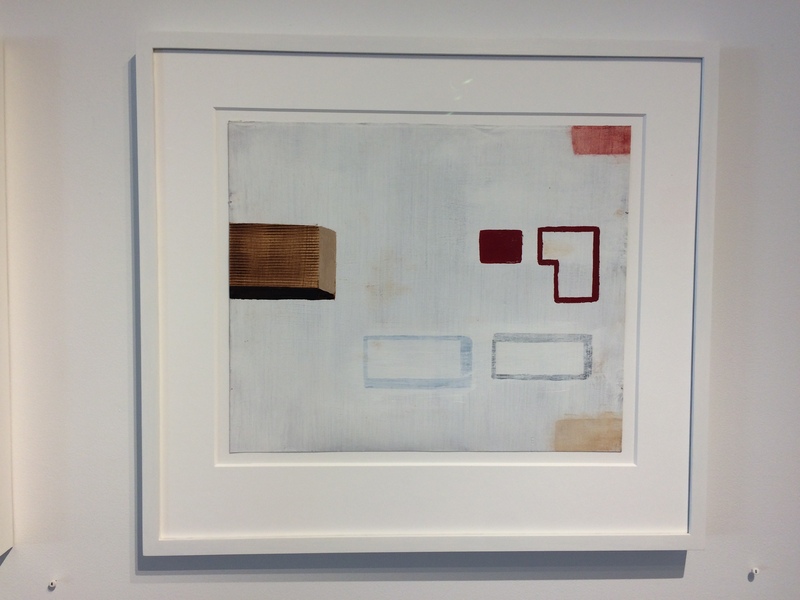 Maude Morgan and Terri Priest both incorporate geometric principles in their work. Maude Morgan painting “Gold Coast II” features bright squares in the center of the canvas that pulsate against the background. In the lower left corner there is series of striking turquoise rectangles. 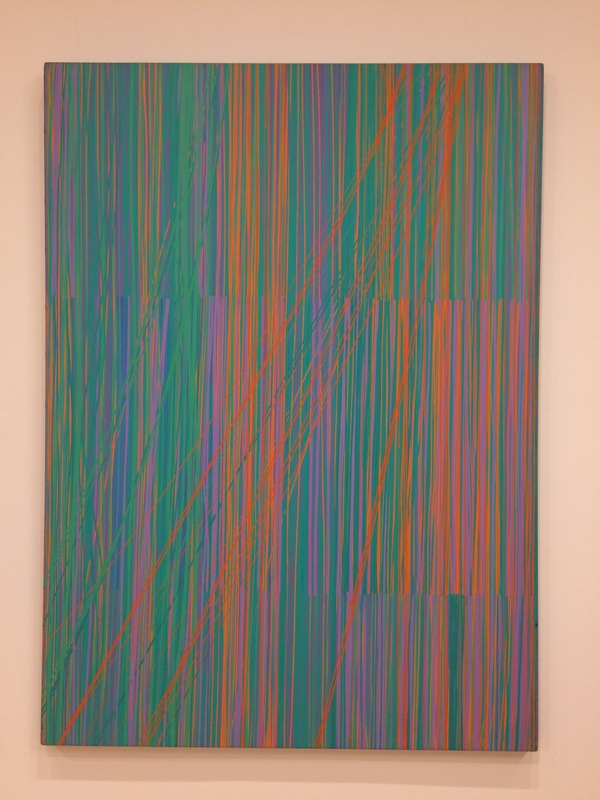 Terri Priest’s “Panoply, Summer Evening” from 1976 utilizes vertical parallel lines to create a surface that is broken by a few loose orange lines running slightly off the diagonal. This exhibit also showcases more contemporary art. 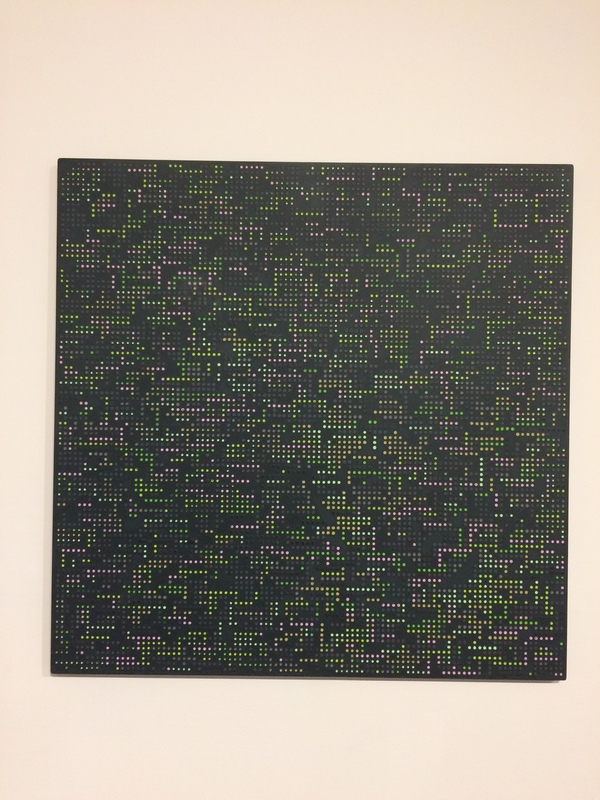 Reese Inman’s “Stinglattice II” from 2006. With experience as a computer programmer, Priest uses algorithms and a computer print-out plan for each of the colors within the grid. She then hand-paints each dot onto the canvas. The art on display spans six decades, demonstrating the many styles and themes that fall under the umbrella of abstract painting. Mathematical influences appear throughout this history.